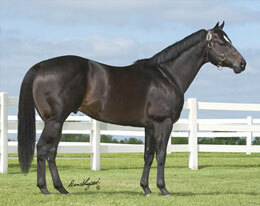 Ivory James' Marfilmio posted the second fastest time for the $52,600 North Central QH Racing Association Futurity at Canterbury Park on Sunday. SHAKOPEE, MN�JULY 23, 2017� Marfilmio, a Texas-bred by Ivory James posted the second fastest qualifying time for the North Central QH Racing Association Futurity at Canterbury Park on Sunday. The 10 fastest qualifiers, from five trial races contested Sunday, will return to Canterbury Park on Sunday, August 6 to vie for the winner's share of a $52,600 purse going 350 yards. Marfilmio broke his maiden in the second trial to get the second fastest clocking of :17.909 seconds. The gray colt ducked in at the break under jockey Ismael Ricardo Suarez but still earned a 95-speed index into the 15-mph crosswind. Victor Hanson conditions Marfilmio for owners David and Debra Harsche. Bobby D. Cox bred the colt from the Mr Jess Perry mare Sinuous. He has compiled a (5) 1-2-0 record and banked nearly $10,000 this year. For a complete list of finalists for the NCQHRA Futurity with times, sires, dams, owners, breeders, trainers and jockeys CLICK HERE.